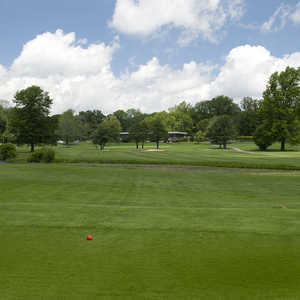 BRECKSVILLE, OHIO - Sleepy Hollow Golf Course in the Cleveland suburb of Brecksville needs to send a couple of belated thank-you notes. And as the placard points out just off the first tee, none of it would be there were it not for the glaciers from about 20,000 years ago that covered this ground more than a mile deep. When the glaciers finally retreated some 14,000 years ago, the resulting glens, glades and dales below were left behind. Flash-forward a few more thousand years and you have a great golf course full of players sneaking one-iron shots onto 220-yard par threes and putting for birdies instead of shooting them. If Sleepy Hollow seems to be one of those rare public courses in Ohio that truly has country club conditions, it's because it once was just that. And that thank you note should go to a man who is in many ways the father of public golf in Cleveland. Decades ago when Ret. Ohio Sen. Howard Metzenbaum was looking to play a few rounds of golf a couple of times a month, he was denied membership here. He figured it was because he was Jewish. Metzenbaum, who would later become a multi-millionaire and hero of rank-and-file workmen and their union causes, didn't turn the other cheek and get his tee-times elsewhere. He filed a lawsuit against the country club in the name of his wife, and then set out to get even. The country club had been built on public land. That was all he needed to know. Tens of thousands of dollars in legal fees later, Metzenbaum won his case. Now everybody can enjoy these swoops and slides through gentle valleys and ridges with views of northern Ohio that nearly stretch to the blue umbrella skies of Lake Erie and the distant towers of Cleveland on clear days. Forget about memberships, as this is now a bastion of quality, daily fee golf. There was a nice touch, too, to the way the course switched ownership. Park rangers actually came on New Years Eve in 1963 to claim it for the public. Nobody knows if they busted up a social gathering when they arrived, but the smart money says that the local gentry were embroiled in a traditional country club New Year's Eve party. The discriminating country club folded and this challenging 18-hole array became a public Sleepy Hollow. The country club that opened in 1925, the roaring 20s, would become a home for the workingman golfer every day from that night onward. Besides its place in local legal and tee-time lore, there are at least a couple of other reasons why Sleepy Hollow is a destination worth a couple-hour car drive or a stolen round while visiting Cleveland on a business trip. The greens at Sleepy Hollow, with their deceptive grading that appears flat but causes some sweeping, slow-moving rolls, have caused many a golfer to question his putting prowess. The weekend golfer often finds himself befuddled about the break because he will see it only after he strikes his putt and the ball begins a horrible roll in that disturbing curlicue - maybe ending in the hole but probably not. In the summer under drought conditions and the baked-sun summer heat of Northeast Ohio, these greens are beyond challenging. What's more, the age and richness of the greens throws off a golfer's perspective: the grass feels spongy but the roll is quick as a marble in a soup bowl. And the challenges of Sleepy Hollow don't end there. The fairways undulate and offer thick grass that limits roll and makes the course play a couple of hundred yards longer than the scorecard's tepid 6,671 yards. Steep, unforgiving ravines run along and up to most fairways. Huge old oak trees, some with trunks so big that two men cannot wrap their arms around them, protect dinky greens. The trees are full of lichen and moss. There are more than 65 bunkers. Not all the greens are small, though. The No. 2 and No. 12 greens are double greens, a common practice during the era in which the course was built. The flamboyant architect Stanley Thompson, who has long since walked into the final gloaming and over the rainbow, designed Sleepy Hollow. Thompson, says John Fiander, golf professional and clubhouse manager, was a bon vivant for sure who is also known as the greatest golf architect of all-time, according to the Royal Canadian Golf Association. "For the 75th anniversary of the club, I did quite a bit of research," Fiander said. "He's the father of strategic golf. Why flamboyant? He made fortunes and lost several fortunes. He drank a bit and spent the money and got broke. Then he would build his fortune again." One of his signatures is also at Sleepy Hollow: the forbidding and unlikely par three second hole. Number two plays 240 yards from the tips and 220 from the white tees. It's a 2 or 3-iron poke for the big hitter and fairway wood for everybody else. Another nice hole is No.7 because it is a good example of early strategic golf course design. "It plays across the valley and you chew off as much as you want," Fiander said. "When you look at this course you see that it's full-strategic architecture." So, too, is the 312 yard par 4 17th, which plays to 272 yards uphill on a dogleg from the white tees. Go for the green -- and an eagle -- on the drive and the nearby woods await to exact punishment on errant tee shots. Every other year the course hosts the Greater Cleveland Amateur Championship in early August and for the past two years it has been the site of the U.S.G.A. Public Links qualifier. There have been changes to the course over time. The No. 8 green was rejected a few years ago as too arduous, so it was rebuilt. People didn't like watching their putts roll back at them, and it slowed play considerably. "It got to be a circus," says Fiander. "The key to the course is to stay below the holes, close to the crest on the greens. Where ever you play your shots, don't let the golf get in the way of the beauty. On some days you can see clear across the valley. There aren't too many other views around here like that." 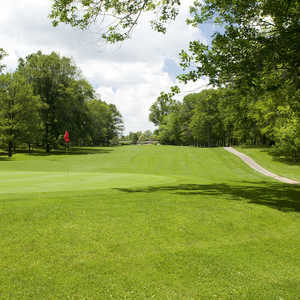 What was the name of the Private Country Club before it became a public course we know as Sleepy Hollow? I have a group of bowlers coming to the area in early April. Will I need tee times to get a couple foursomes in on probably Friday A.M. or Sat.